We are looking for an engineer interested in working in our company in France near Aix les Bains. The position is for our engineering department. We expect skills in special machines processes with perfect knowledge on Solidworks. 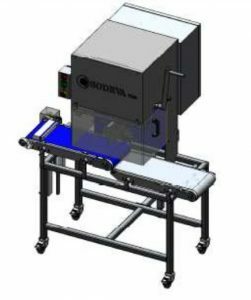 Our machines are specialised in ultrasonic cutting, sieving and cleaning for the food industry. He will be in contact with our Canadian subsidiary with US customers. Job located in France, not necessary to speak French but it would be an asset. 10 years of experience needed. Salary upon experience, French legislation so totally covered in health with family extension. You are an experienced Design Engineer (Minimum 10 years) from a Mechanical Product background, who has designed Products on Solidworks looking for a challenging new position, working on new product development projects. * Produce conceptual designs using sketches and 3D CAD, and produce 3D CAD models and drawings that can be used for prototyping, tooling, machining drawings for final production of products using Solidworks systems. * Provide mechanical designs across a number of product groups, working closely with prototype and test resources to ensure that design verification is achieved. * Experience of designing machinery from product concept through to manufacture. Able to specify motors and PLC. * Able to deliver effective product designs requiring strong ergonomic consideration and sensitivity to brand images that meet the specification on time and to budget constraints. * Experience in producing component and product costs, and ability to maintain knowledge of costs as the design evolves in order to provide estimated costings for proposed projects.